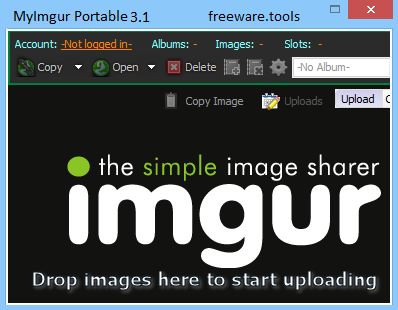 MyImgur Portable is the handy capture and uploader tool for Windows. 1-click actions and simple settings to quickly capture areas of your screen send them to Imgur for sharing, or select a few files from your computer and drag them to Imgur to have them sent in a batch without any further actions. Features include full Imgur account support (upload to selected album, create or delete albums, and delete all albums pictures), context-menu for right-click on pictures > Send to Imgur, batch uploads, drop all your pictures in the window and they'll be automatically queued, smart settings to automatically adjust picture quality or size for faster uploads and more. Designed as the portable counterpart of MyImgur, this is a desktop client that lets you conveniently take screenshots and upload the images to your Imgur account. It comes packed with a bunch of interesting options that you can easily fiddle with and which help you speed up the entire operation. As there is no setup pack involved, you can extract the program files to a custom location on the disk and just click the executable to launch MyImgur. Another possibility is to save it to a pen drive or other removable storage unit to directly run it on any computer, without having to install anything beforehand. An important aspect worth keeping in mind is that, unlike most programs with installers, MyImgur does not contribute with new entries to the Windows registry, so it doesn't increase the risk of OS stability issues. The interface is pretty easy to deal with. It is based on a small window that shows several buttons and lets you easily set up your Imgur account information (if necessary). You can directly upload local images as long as they have the JPG, PNG, BMP or GIF format, or capture any region of the screen or active window, which will be automatically uploaded (this is indicated by a notification message popping up from the system tray). There are a lot configuration settings available for MyImgur. For example, you can specify the size and quality for uploaded pics, make new albums hidden, secret or public, point out a naming pattern for the photos, ask the tool to automatically copy the Imgur link to the Clipboard right after upload and to open the page in the browser, as well as to use only the primary monitor (multiple monitors are supported). What's more, the program can be minimized to the system tray area to become non-intrusive, run at every Windows startup until further notice, and close after upload. You can also configure keyboard shortcuts for quickly selecting files, capturing the screen area and selecting the Aero window, apply a proxy configuration for connecting to the Internet, change the UI visual style and background image, and so on. Taking into account its practical features and numerous settings, MyImgur should meet the requirements of most users looking to easily upload pictures to the Imgur file sharing website.